Share "Tips On Cleaning Grill Grates"
Cleaning a grill is never any fun. They require a lot of elbow grease, but if you want to have a quality cookout this summer it’s a chore that needs to be done. If you’re an aspiring grill master and want to serve the best quality grilled food to your family and friends, then this article is just for you. Cleaning your grill grate regularly will not only keep the food particles from building up, it will also prevent harmful bacteria from collecting and decrease the risk of fires and burnt foods. To clean your grill grates this season, take a dive and try one of these three cleaning methods: burning, soaking, or brushing. There’s no one size fits all method to cleaning your grill. The methods described in this article are common techniques and helpful tips, but feel free to use a variety of different methods to get the job done. The first method to clean grill grates is the burning method. By burning the grill grates, we are cooking off the remaining food and grease still left. One tip to burning your grill clean is to cover the top of the grates with aluminum foil while the grill is on high and close the lid. After about 15 minutes, remove the foil and brush the white ash off the grill and wipe it clean with oven cleaner. Another trick to burning is to simply put your grate through your ovens’ self-cleaning process. This may discolor your grates, but it’s effective and requires little effort. The second method to clean your grill grate is soaking them in a solution of vinegar and baking soda. Let the grates soak for a couple of hours or overnight pending on how dirty they are. Using a steel wool pad, scrub the grates clean and remove any debris. Rinse your grates with a hose or in your sink and they’re ready for cooking. Make sure to rinse thoroughly so that no chemical particles can seep into the food while grilling. The final method to clean your grill is the brushing technique. 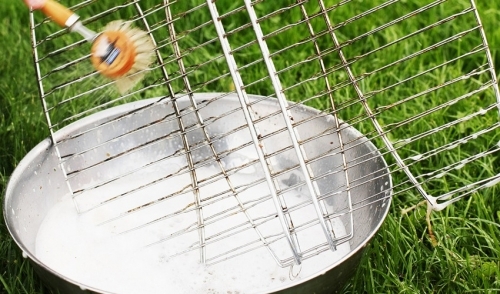 Brushing is the classic quick fix that all grill masters should do after each use. Make sure to pick up a quality steel wool or brass brush from your local hardware store. It’s best to brush the grate while the grill is still hot. After the grates have cooled down, spray a little cleaner and brush the grill again if there’s any debris still left. Follow these tips and methods to achieve a cleaner grill this year. Don’t be afraid to mix and match and create a method that best works for you. With a clean grill grate, your food will be the highlight of the summer.